Last week I received something I ordered online. Yes! 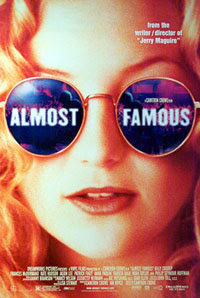 The one and only, oscar winning, ‘ Almost Famous‘, directed by Cameron Crowe. One of my favorite movies of the last past years. The story is about a young teenage journalist, William. His love for music brings him an assignment for the Rolling Stone magazine. What starts as a simple interview with the band Stillwater, ends up for William in an ‘eye-opening’ life journey in American Rock. Hidding the road with his favorite band, using the privileges of youth and discovering during his trip, the real value of friends and family in life. Besides the beautfiul music, it’s great to see the friendship of William and the extraordinairy ‘band aid’ Penny Lane (Kate Hudson) getting intenser.